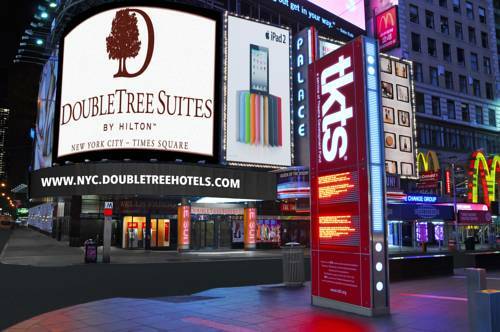 DoubleTree Suites by Hilton New York City - Times Square is the only all-suite hotel on Broadway in the heart of Times Square. Located at 1568 Broadway at 47th Street and 7th Avenue this modern hotel soars 45 stories above Manhattan and is surrounded by Broadway theaters New York City*s world-famous restaurants shopping and museums. Overlooking the New Year*s Eve Ball Drop and directly across from the TKTS discount theater ticket booth this hotel is walking distance to Radio City Music Hall Rockefeller Center Restaurant Row St. Patrick*s Cathedral Central Park Carnegie Hall the Museum of Modern Art and lively nightlife. The annual Macy*s Thanksgiving Day Parade is one block away. The Port Authority Bus Terminal Penn Station Grand Central Station all major public transportation including bus and subway and Jacob Javits Convention Center are nearby. DoubleTree Suites by Hilton Times Square offers 468 two-room suites with living room private bedroom and oversized bathroom. In-suite amenities include a sofa bed two flat-screen televisions a wet bar refrigerator microwave and large work desk with ergonomic chair. Additional hotel amenities include renovated lobby Concierge/Theater Ticket Desk brand new lobby bar called Ad Lib Gingers Restaurant morning Coffee Kiosk room service complimentary 24-hour fitness center and complimentary 24-hour business center. The hotel has 10 000 sq. ft. of newly renovated meeting and event space and business travelers will appreciate the convenient location and extra space provided by our two-room suites. Conveniently located within 20 miles of JFK LaGuardia and Newark Liberty International Airports DoubleTree Suites by Hilton Times Square places you in the center of Times Square excitement. The hotel is 100 percent non-smoking. Self and valet parking are available. The hotel allows pets under 60 lbs. Onsite 24-hour security is provided. A credit card guarantee is required on all reservations regardless of arrival time. Individual plans may vary. See plan display for more information . Please see cancellation policy for cancel procedures of a guaranteed reservation. Our Coffee bar at Ad Lib is open daily and features international coffees and a wide selection of pastries and sandwiches. Relax in your luxurious guest suite while enjoying in-suite dining. Ask about our on-site Catering services for any last minute food and beverage for your meeting event or in-suite meeting. Call our Sales Department Monday through Friday during business hours to arrange. - Intrepid Sea - Air Space Mus.